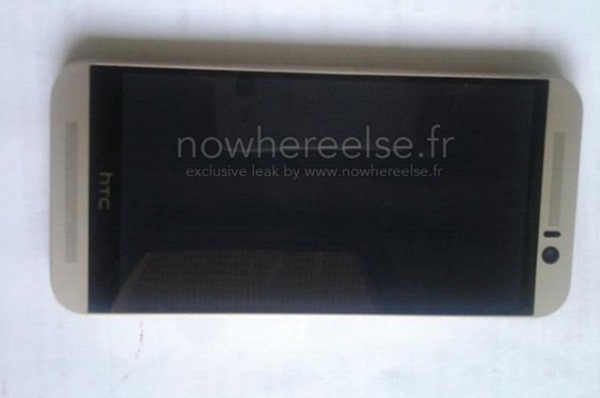 HTC One M9 has just made a quick appearance online in a pair of leaked photos. This is the first time we have gotten a glimpse of HTC’s upcoming flagship smartphone, so read on after the break for more details on this subject and the leaked photos. Just a couple of days back we saw the Taiwanese phone maker send out invitations to its event at the Mobile World Congress 2015 in Barcelona, with the caption, “Join us to see what’s next”. 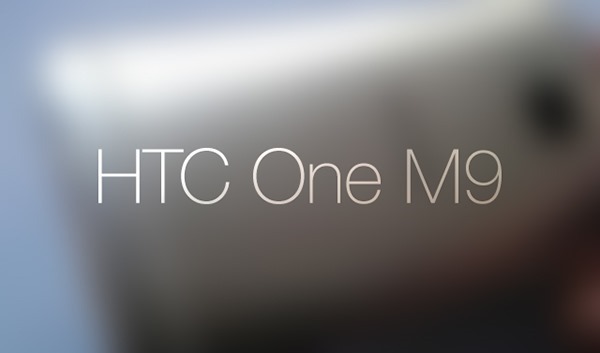 Thereby we can be sure that HTC will be revealing the M9 on the 1st of March. 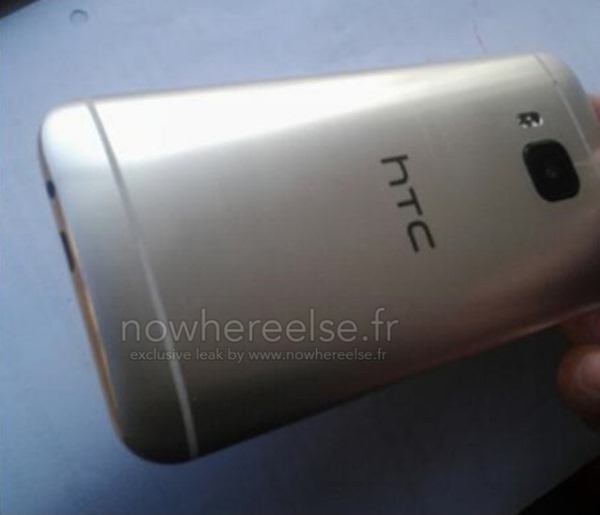 While supposed hardware specs and features have been talked about in great length for the HTC One M9, and where the design elements have been speculated as well, it was always reported that the new phone will be much like the preceding M8 on the design front and will be using the same choice of materials for the construction. ‘One’ look at these leaked photos, and you can instantaneously mistake it for the M8, that is until you gaze upon the camera housing which is a distinctive single module compared to the M8’s dual-camera configuration. The photos had been leaked by Nowhereelse, but a few hours after the shots were published online, the source of NWE had requested for the photos to be pulled from the site, which was complied with. This lone camera module is reportedly going to be a stellar 20MP unit which will see HTC drop the ‘UltraPixel’ take on its smartphone cameras since the HTC One M7 was released. Under the hood, the phone should be running the Snapdragon 810 chipset along with the Adreno 430 GPU. Coupled with 3GB of RAM, HTC has decided to stick to the 5-inch 1080p display and is not willing to play ball with the industry race on this front. The front-facing camera though, is said to be an UltraPixel one. The One M9 will be the first HTC phone to be revealed running the latest Android 5.0 Lollipop, and when released to the customers, the phone will be running the Google’s latest OS right out of the box. While the Lollipop update is being rolled out for unlocked and developer editions of the M8, the M7 is expected to get the update fairly soon. I downloaded the movies American Sniper, The Wedding Ringer, Selma, Taken 3, Night At The Museum 2, Into the Woods, The Gambler, The Hobbit: The Battle of the Five Armies, Unbroken, John Wick, The Hunger Games: Mockingjay, Big Eyes, The Imitation Game, Big Hero 6, Fury, The Equalizer, Horrible Bosses 2, The Interview and Exodus: Gods and Kings on my iPhone 6 and PC from the “bigU Movies” app I got from Cydia. I think either xsellize repo, insanelyi repo, Appcake or Zeusmos has the bigU Movies app.. HUGE LEAK: Of what MAY be two photos of the phone…so what’s the huge leak again? Would you have clicked on the link if it didn’t say HUGE LEAK? It’s known as click bait, which this site has degraded into using constantly. If this is what the phone is actually going to look like then I’m not buying it. Want me to all you a wahmbulance?